Manchester United travel to Wembley to take on Tottenham on Sunday, in what will be Ole Gunnar Solskjaer's biggest test as Man UTD manager. Who will claim the bragging rights? Check out here our Tottenham vs Manchester UTD betting preview with predictions, betting tips, probable lineups, team news, enhanced odds, bookie promotions and no deposit free bets! Tottenham have won 6 of their last 7 in the Premier League, with only their shock 3-1 defeat at home to Wolves stemming the flow. As a result, they trail league leaders Liverpool by just six points. They have recently put seven past Tranmere Rovers in the 2019 FA Cup third round while their 1-0 win over Chelsea on Tuesday put them in a fine position to make it to the Carabao Cup Final. Mauricio Pochettino's men have scored 23 goals in their last six matches. Spurs also have a psychological edge as they won 3-0 the reverse match at Old Trafford in August. Jan Vertonghen, Mousa Dembele and Eric Dier are both in contention after returning to training. Lucas Moura will be assessed before the kick-off, while Victor Wanyama is out. Harry Winks and Moussa Sissoko look secure starters in midfield - though Oliver Skipp is another option there if needed. Dele Alli, Christian Eriksen and Son Heung Min will play behind the lone striker Harry Kane, with the South Korean playing his last match before departing for the Asian Cup. The fit-again Serge Aurier could put pressure on Kieran Trippier at right-back, while Ben Davies will contest the left-back slot with Danny Rose. Manchester United travel to Wembley Stadium enjoying a sequence of five wins in all competitions under new manager Ole Gunnar Solskjaer, although none of those games have been against teams from the current Premier League top 10. Hence, this will be the toughest challenge for the reinvigorated Red Devils, after beating Cardiff (1-5), Huddersfield (3-1), Bournemouth (4-1), and Newcastle (0-2). Solskjaer's men recently beat Reading (2-0) in FA Cup with goals from Mata and Lukaku, meaning they have kept a rare back-to-back clean sheet this season. Eric Bailly misses out through suspension while Marcos Rojo ruled out through injury. Plus, Chris Smalling, Alexis Sanchez and Paul Pogba will all face late fitness tests. Marcus Rashford's form is likely to keep Romelu Lukaku out of the starting line-up, with the youngster expected to be flanked by Anthony Martial and Jesse Lingard. The likes of Nemanja Matic and Ander Herrera will anchor the midfield while Ashley Young should get the nod over Antonio Valencia and Diogo Dalot as right back. The veteran defender will form the four man backline alongside Victor Lindelof, Phil Jones and Luke Shaw. 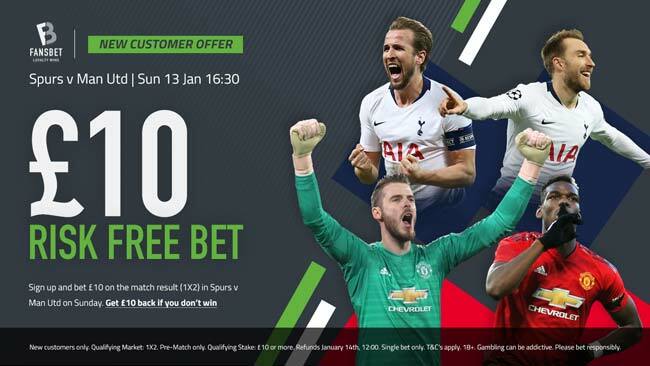 We compare odds from all the Top UK Betting Sites and you can find below the highest prices on the Tottenahm vs Man UTD match winner market. Wanna know which bookmaker is offering Best Odds Guaranteed on football, which are the price boost offers for today or which are the bookmakers with the highest odds on average? At Bet and Skill we don’t miss a thing, and as far as we’re concerned, you shouldn’t either. Get 60/1 Man UTD to beat Tottenham with Betfair! New Customers can get Man Utd at an enhanced 60/1 to beat Spurs. Max Stake £1. Winnings paid in free bets, valid for 7 days, only deposits with cards/Paypal count. Exchange and multiple bets excluded. T&C’s Apply. 18+|Gamble Aware. Our award-winning team have deeply analysed this clash, coming up with four betting tips. Feel free to copy or Tottenham v Manchester UTD free predictions. And if you want to start betting with no risks attached, no problem.. we have a lot of no deposit free bets for UK and worldwide customers! Are you an acca backer? Take a look at our free accumulator tips for the weekend! All the best online bookmakers push their accumulator deals each and every weekend and here at Bet and Skill, we find all the best ones for you to back. MoPlay offer 29/1 Manchester UTD to score in both halves vs Tottenham. Max bet £1! Maximum stake £1. Return paid as market odds of 4.0 in real cash and 26.0 as a Free Bet. Bet must be placed on MoPlay Upgrades market within the Tottenham vs Man Utd match. Tottenham vs Man Utd 13/01/2019 Premier League Fixture. Pre-event only. No Cash Out. Single only. Cannot be combined with other bets. One bet per customer. 18+. Stake/Player restrictions and General Betting Rules apply. "Tottenham v Manchester UTD Predictions, Betting Tips, Lineups & Odds (Premier League - 13.1.2019)"